This morning we left our eerie in the Glenmore Forest in bright sunshine, and headed for Braemar. We'd booked onto a camp site because we needed to service the van, (empty the grey waste and loo, and fill up with fresh water), and we also wanted to visit Balmoral Castle and this was the nearest camp site to it. However, we didn't go straight there, but made several stops along the way, the first being at the Rothiemurchus Farm Shop where we purchased their own farm reared steak, venison and trout and also a small amount of Haggis! Then we continued on to Tesco to do some proper shopping, and after that the Tardis informed us that she needed feeding as well so we stopped to fill up with diesel, but still had to to go to another garage to find gas. We have a Gaslow System fitted to our van with refillable tanks, so the gas needs to be pumped in much the same way that diesel does, however, as this was our first fill up, and as we had read that this procedure can sometimes be awkward we approached it with some intrepidation. To add to the difficulty John had to negotiate a very narrow passage to get to the pump, and afterwards, he had to reverse back down the same narrow space and then out onto a main road. We needn't have worried because both tasks were achieved with aplomb!! After that we continued on along a 'Clarkson Road' (think Top Gear😁) - we didn't have the fast car but the journey over high hills and low valleys was fantastic. Our goal was Tomintoul, and in particular, The Whisky Castle there - we (or mostly I because John was driving) were provided with generous measures of our favourite heavily peated whisky to try! The lady behind the counter was an absolute fountain of knowledge, but she also seemed quite tipsy because every time she poured a dram for a customer she also poured a taste for herself - what a fantastic job! She told us about the 'Legs' - these are the runs that form on the glass after the whisky has been swirled, and apparently peated whiskey has longer legs than others! She also explained how to smell and taste the whisky, and finally, she told us about the 'Angel's Tear'. This is the tiny drop of water (bottled only) that should be added to allow the oils and flavours within the whisky to be released. Following this lovely experience we trundled on towards our destination, but on the way we stopped at the summit of an old military road for lunch which resulted in us arriving in Braemar at about 3pm. Then we had van ablutions to complete before we nipped out for a walk around the village. Later we returned to the Tardis, for tea, and finally we couldn't resist a sample of our recent purchases before bedtime. Our first port of call this morning was Balmoral Castle, and when we got there we were quite surprised to find designated motor home parking spaces, and also signs inviting us to spend the night if we wished. However, as it was only 10am this was not our intention. We paid to go into the Castle and Grounds and we were provided with an audio guided handset to accompany and inform us as we toured the estate. It told us how Queen Victoria and Prince Albert initially purchased Balmoral, and subsequently rebuilt it; it told us about how the estate, along with all it's wildlife are managed; and it also provided interesting facts about how the Castle is prepared and 'put to bed' when the Royal Family visit and depart. The castle closes on July 31st because this is when the Royals holiday, and it was quite fascinating to hear how so many things are geared to coincide with this, for example, many of the flowers and vegetables are planned specifically to be at their best at that time. The only room in the Castle that the public can visit is the Ballroom and this is where we were amused to see a film of an electric powered Citroen C4 being driven around by a very young Prince Charles, with Princess Anne trying to cadge a lift. We could just imagine our Grandsons Jack and Thomas playing with it. Following our tour we sat by the River Dee for a while in lovely sunshine, but soon decided to retreat to the Tardis for coffee and cake, and to ponder on what to do next. In the end we headed back to Braemar and parked in a little car park where we thought we might spend the night, but our immediate plan was to ride along the near deserted minor road to see the Linn of Dee - a place where the river passes through a 300 metre natural rock gorge. 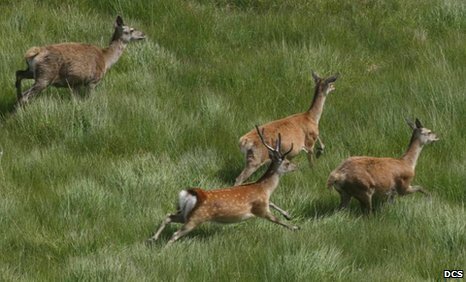 As we cycled towards our goal we were rewarded with the sight of several deer with their young bounding and bonging along a field and leaping over a fence. The Linn of Dee is where a bridge crosses a river and where the river has scoured a narrow channel through the rocks forming a fast flowing torrent that tumbles through the rocky glen providing a speculator sight! From here we continued on our way for another couple of miles, and stumbled across another beauty spot, the Linn of Quoich, and it was here that we sat for coffee and a noggin of Mrs Tilly's fudge. The road ended here so our choice was to retrace our steps or to continue on a rough cycle trail. We decided to go back but we had not gone far when John decided we should take a short cut through Mar Lodge grounds. This track was also a bit rough and we did manage to upset a pack of dogs in somebodies garden (at least 6), but we only needed to go about half a mile before we crossed a bridge and rejoined the road. The road undulated up and down but it was never very steep and we made good time on our return journey, and we had also been lucky enough to spot another parking area which we decided would make an excellent 'wild-camp' for the night. We collected the Tardis and proceeded to said spot which was sheltered and secluded, and also high up above the River Dee. It was probably one of the most beautiful camping places we have had on this holiday, and to add to our delight we were entertained by a buzzard circling and soaring while trying to catch it's dinner. Our dinner was trout from the Rothiemurchus estate - and very nice it was too. We left our lovely parking spot and headed back down to Braemar, and then up to Glenshee where we parked at the Ski Centre and followed a path up to 'The Cairnwell Station' at approx 933 metres. The way was very steep and because the scree was loose underfoot it was very precarious in places, and even more treacherous on the way back down. Initially the path was cluttered with ski lift paraphernalia, but as we climbed higher we mostly left that behind and the views were stunning as we passed Loch Vratachen, and then further on we had far reaching views over other hills and scree slopes in the area. We eventually achieved the summit and sat and ate our picnic overlooking a fantastic vista where we could see nothing but more hills and slopes - however, the only way down was to retrace our steps - every other way was over precipitous drops that would only be available to an expert piste skier!! We returned to the Tardis and were undecided what to do next. We had thought we would overnight on Glenshee but it was still quite early (2.30pm) and the lower slopes around the ski centre were a bit like a building site, so in the end we set off in search of a more scenic venue. We travelled through Glenshee and didn't really spot anywhere we fancied stopping so we continued on towards Killicrankie and then on to Lock Tummel. We eventually parked up at The Queen's View Visitor Centre, and form there visited the view point overlooking Loch Tummel. It's thought that the site may have been named for Queen Victoria's visit in 1866, but it's more likely related to Isabella of Mar who was the first wife of Robert the Bruce and who is said to have hid in the woods around here in the 13th Century. As there were no parking restrictions in the car park we decided to overnight there and as the evening wore on we were joined by several other vans. We headed back to Killicrankie this morning because we wanted to see The Linn of Tummel and Soldiers Leap. We parked in the visitor centre car park and were soon descending down long flights of steps into the gorge through which the River Garry flows, and it was here that we found 'The Soldiers Leap'. This is a place where it is said that a Red Coat Soldier - Donald McBane - leapt 18 feet across the River Garry to escape from Jacobite Clansman - he must have been terrified because it looked to be a fearsome jump! We continued on our way thinking we would walk to the Linn, but we never did quite make it, however on our way we passed a huge Railway viaduct that was build in 1863 and is still in use today. By this time we had already walked quite a long way so when the rain started we changed our plan and retraced our steps to the Visitors Centre deciding that we would move the van to visit the Linn. However, by the time we had retraced out steps the rain had stopped, so we passed a bit more time by watching a red squirrel collecting nuts form a box, and also an assortment of small birds feasting from bird feeders. Eventually we moved on and travelled a couple of miles down the road and parked in the Linn of Tummel car park where we had lunch and then proceeded back down to the river. Here we observed the unexpected spectacle of The Highland Fling Bungee jumpers. This was where members of the public could pay to fling themselves off a platform under the Garry Bridge - we didn't bother stopping to have a go!! We walked on for another mile or so and came to the rougher waters where Loch Tummel discharges into The Linn of Tummel before entering the River Garry forming fast flowing rapids and little waterfalls. It was here that the white water rafters were playing - but we gave that a miss too!! For us the walk was about being allowed to see this spectacular stretch of the River Garry and that provided enough excitement and entertainment for us. After seeing nature's fantastic show we decided we had waked far enough for one day (about 9 miles) so we returned to the van and set off in search of a sleeping place for tonight. We drove along a narrow twisty B road at the side of Loch Tummel, and this was where we nearly came to grief when a huge coach appeared in the middle of the road around a blind bend. However, we were soon safely on our way again following a bit of manoeuvring by both the bus driver and John - we all breathed in at once and got safely passed! Our onward journey took us through Kinloch Rannock and as we didn't see any appropriate parking areas where we could stop for the night we continued on to a little Forestry Commission Camp Site called Kilvrecht. The site is very informal and basic and absolutely no signs telling us what we can and can't do! All we had to do was drive on and pick our own spot, then the warden called in the morning for the money. The facilities were just about non existent, but all we needed was space for our 4 wheels and a good view so for the fee of just £8 we are quite happy.